Sky Island Scriber: Happy Valentine's Day...NOT! On this Valentine's Day, I thought I'd ask, when it comes to our public schools students in Arizona, "who loves you baby?" Yesterday, I was listening in on the AZ House Education Committee meeting. There were many bills on the agenda, but I was primarily interested in HB 2394; empowerment scholarship accounts [ESAs]; expansion; phase-in. I wasn’t hopeful the bill would die, as its companion bill SB 1431, had already been given a due-pass by the Senate Education Committee. As expected, HB 2394 followed suit on a 6–5 vote as did HB 2465, which will allow all students eligible for an ESA account to remain on the program until age 22 and for up to $2,000 a year to be put into a 529 savings account. The passage of these bills, along with the companion ones in the Senate, demonstrate the disdain many GOP legislators have for our district schools and, for the underpaid educators who toil within. This, because ESAs divert more general fund revenue per student to private schools than district schools receive. As reported by the Arizona School Boards Association, an ESA student, on average, costs the state general fund $1,083 more in grades K–8, and $1,286 more in grades 9–12 than a district student. This is in part because there are many school districts that enjoy a fair amount of locally controlled support in the way of overrides and bonds. The state therefore, is relieved of providing equalization funding to them, but when students leave to go to private schools, all the funding must come from the state general fund. ESA students also receive charter additional assistance funding of roughly $1,200 per student, which district schools do not receive. Turns out that the claim of voucher proponents that they save the state money, is not just “alternative facts” but totally untrue. And, although voucher proponents love to claim there is no harm to district schools when students take their funding and leave, the truth is that about 19 percent of a districts costs are fixed (teacher salaries, transportation, facility repair and maintenance, utilities) and can't be reduced with each student's departure. Americans for Prosperity is a conservative political advocacy group funded by the Koch brothers. On their website they write, "at the very top of AFP-Arizona’s 2017 legislative agenda is the expansion of our state’s program of parental choice Empowerment Scholarship Accounts (ESAs)." They also encourage their supporters to thank Senators Flake and McCain for voting to confirm Betsy DeVos.It should be no surprise to anyone that the AZ Catholic Conference is also interested in fully expanding voucher eligibility. Around the nation, Catholic schools have been closing at rapid rate, from 13,000 schools enrolling 12 percent of U.S. school children in the mid–1960s, to about 7,000 schools enrolling five percent in 2012. In 2015 alone, 88 Catholic schools closed. But, a tax credit program highly favorable to private and parochial schools has helped stem previous losses in Arizona but charters are still causing them much competition for students. There are now 73 Roman Catholic private schools in Arizona and six of them are among the most expensive private schools in the Phoenix area charging from $13,300 to $17,712 per year in tuition. A $5,200 voucher obviously won’t help poor students get into these schools, but it will be a nice offset for those wealthy enough to afford the schools irrespective of the help. The average cost for private schools in Arizona by the way is about $6,000 at the elementary level and $18,000 at the high school level. As for the Arizona Chamber of Commerce, let’s not forget how their President and CEO, Glenn Hamer, recently characterized teachers as "crybabies" for wanting adequate pay. This, when our teachers are the lowest paid in the nation and 53 percent of Arizona’s teaching positions were vacant or filled by uncertified personnel at the beginning of this year. Study after study shows a high-quality teacher is critical to student success. What does that say about the commitment of Hamer and his chamber to our students in Arizona? We all know when we read something, especially these days, we must consider the source. 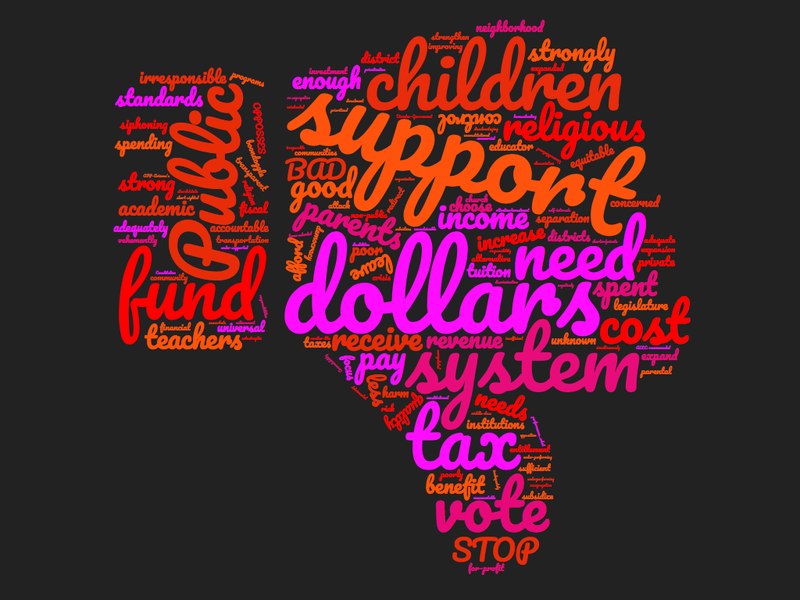 Well, when looking at the support for voucher expansion in Arizona, I highly encourage you to do the same. This fight against the full expansion of vouchers is far from over. Those pushing for it are no doubt emboldened by pro-voucher stance of the new POTUS and his SecED. But, the people of Arizona understand district COMMUNITY schools are the key to not only achievement for all our students, but also to the health of our communities, and the preservation of our Democracy. We must not sit on the sidelines and watch these bills get signed into law. Much too much is at stake. Want to know more about how to plug-in? Comment on this post and I'll be in touch. Please don't let it be said we let our students get sold out!